Residential real estate in Raleigh, N.C.
Our N.C. State basketball team has made it into the Sweet 16 of the NCAA tournament. It’s been a while since we’ve been here, and we’re very excited to be back. 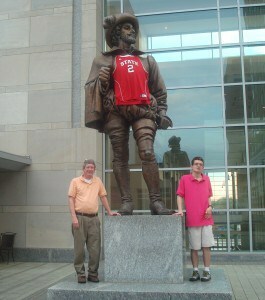 So excited that it seemed appropriate to dress Sir Walter Raleigh up in a Wolfpack jersey. That’s Life in Raleigh….a/k/a Wolfpack Country. Sir Walter Raleigh loves the NCSU Wolfpack! All information on this website is deemed reliable, but not guaranteed, and may change without notice. Any square footage is approximate.